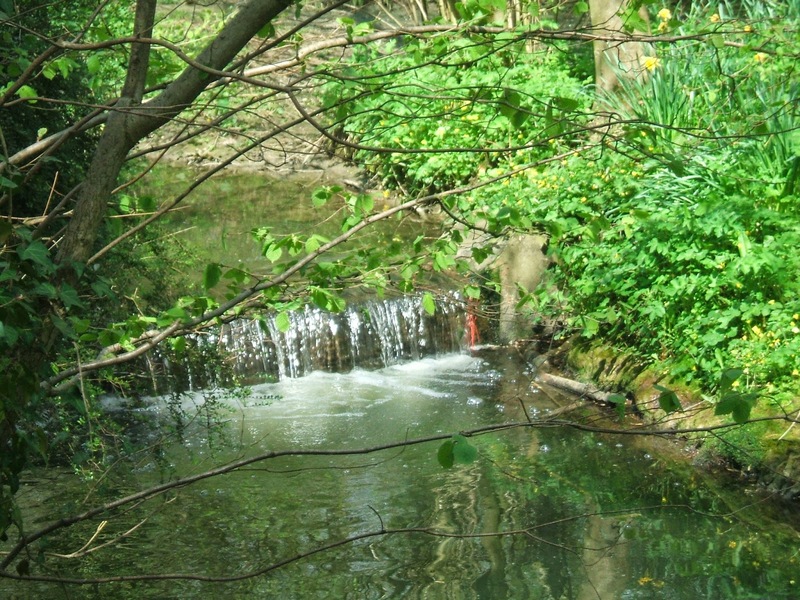 Hi Everyone - sorry if this is rather a long 'un for WOYWW, Julia, but it's mostly pics, and you can whizz through them. Before I start, thank you for all the lovely comments last week. I didn't want (or expect) to hear how great I was to help my friend with her blanket - I'm definitely no Mother Teresa, it was no big deal! I just couldn't imagine how cobbled together it was going to look, after so much time, sweat and tears going into something that wasn't going to be at all square, and simply sewn together. It would probably have put her off crochet for life! 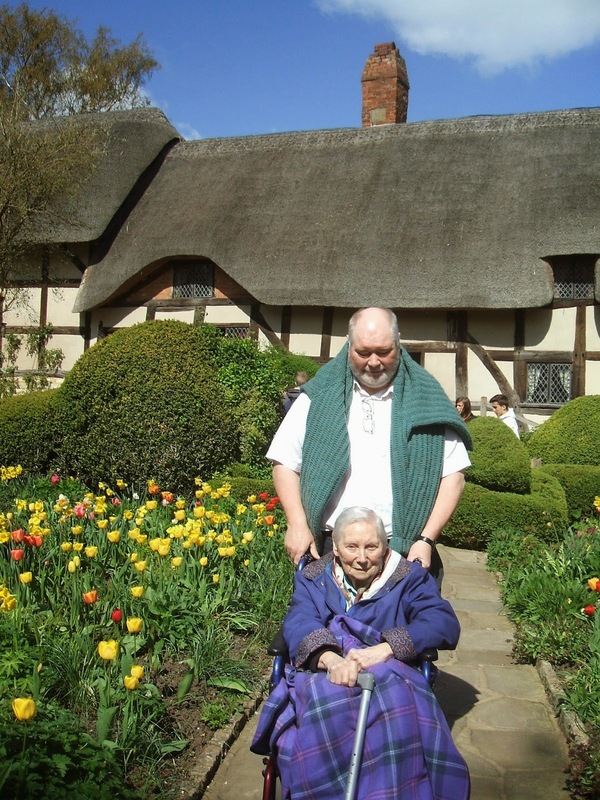 School holidays have a tendency to fly without us doing anything special so, as the weather was so wonderful on Monday, DH and I took Mum to Ann Hathaway's Cottage (Shakespeare's wife, for anyone who didn't know). We had a great time, and the guides were so helpful, making sure that Mum saw as much of the house and grounds as she could. Apparently, no matter how many colour tulips they plant, after 3-4 years, they all seem to revert to yellow or red. The house is beautiful, and very different from the two room home that Ann was brought up in. 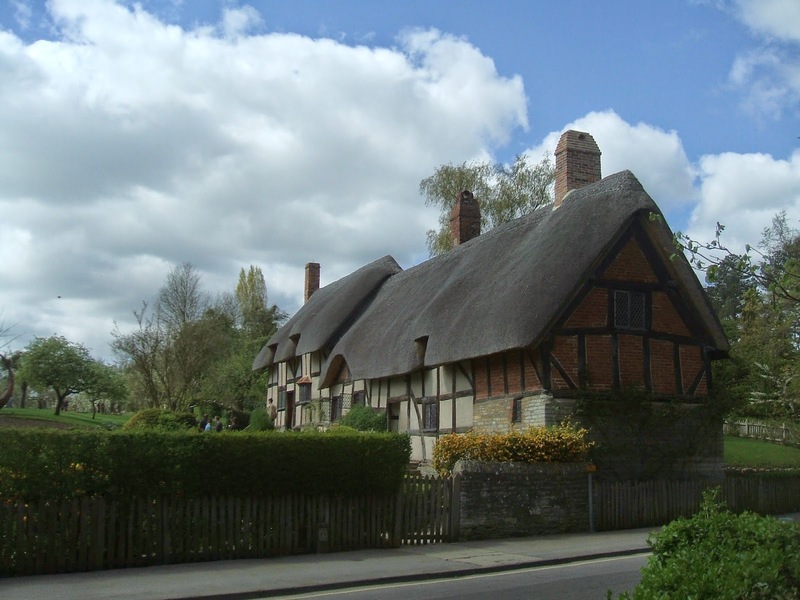 It belonged to the Hathaway family from the time Ann's grandfather was a tenant farmer (late 1400s) to 1911, and has been added to and updated down through the ages. The entrance fee of £9 each sounded expensive to me (cheapskate!! LOL) until I realised that it was for a year's pass. We have decided to go back in June, when the 16 little beds of sweet peas are in flower, that they were planting yesterday, and all the other summer blooms. Nothing spectacular on the crafting front this week - I spent yesterday afternoon in the garden, digging over one of the veg beds. I'll do one each day (four in all) so I don't do myself in. I finished the back of DDs cushion, having finally decided on a pattern. The first couple of tries came out too thick and chunky for the front, so I ended up doing two trebles above each pair below. I haven't shown you Mum's finished room yet, so here it is. I just have to put her family photo's on the long wall above the bed. She's very happy and cosy in there, I'm pleased to say. 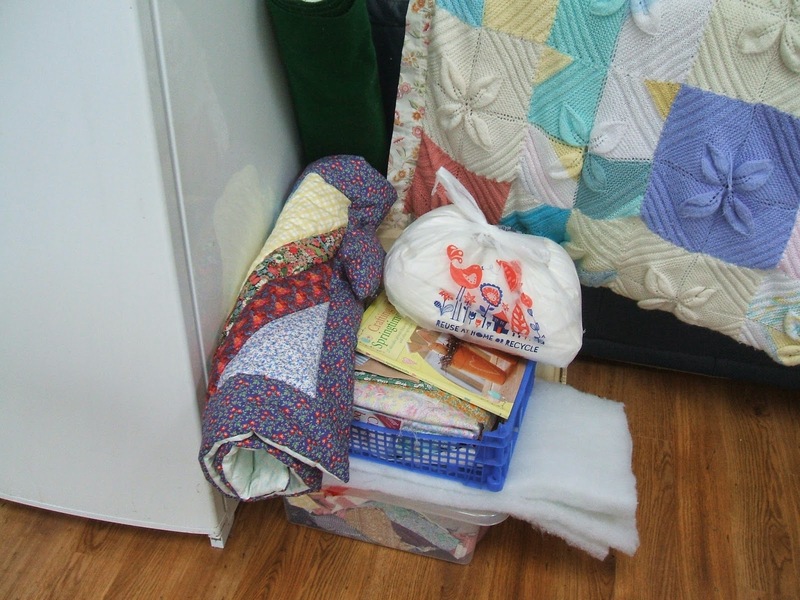 Hopefully, little heaps of stuff like this around the house will soon be things of the past, when I get all my crafty bits upstairs, and sorted in my new craft/guest room. Whoop whoop!! In the meantime, I hope the sun is shining for you as it is here. Have a great week, and don't forget to pop over to see all the work going on around the globe, via Julia's blog. 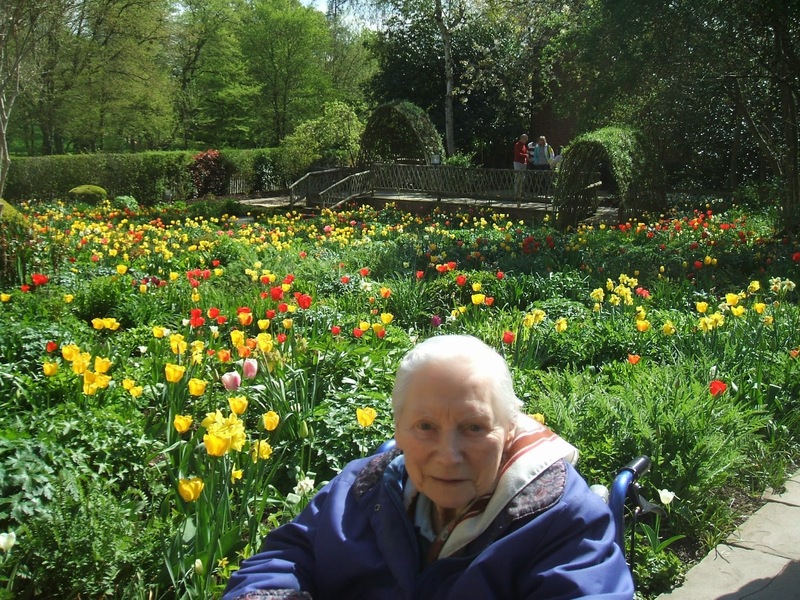 What a beautiful post Chris, glad things are working out better for your mum in the new room, she certainly looks happy on her day out and you had such glorious weather too! I put the finished punchinella card on my desk for this week, and I also posted it properly on my blog on Monday if you'd like a closer look. Sorry I'm late from last week, but at least that means I'm early this week lol! I thoroughly enjoyed your post, Chris, especially the photos of Ann Hathaway's home as that's likely the closest I'll ever get to it! How nice that your Mum was able to see a lot of it, too. Her new room looks very warm and inviting! It won't be long now and you'll have a new craft/guest room to show us on WOYWW!! What great photos Chris and your Mum looks very happy and what a pretty lady. 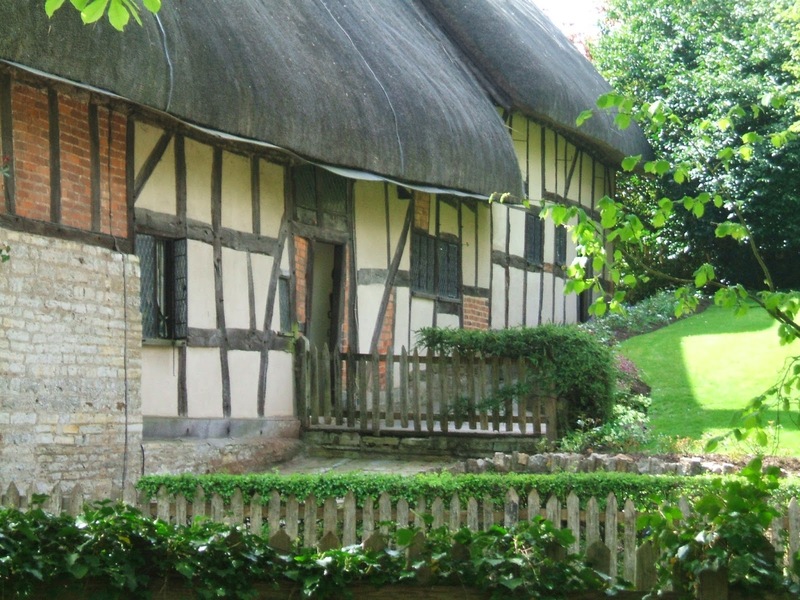 I would love to see England and Ann Hathaway's home, it looks so beautiful. Your Mum's bedroom looks great. 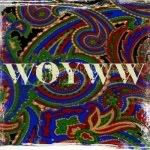 Thanks for dropping by my blog earlier happy WOYWW and have a wonderful fun filled week. What a charming cottage!Glad your Mum had a great day.Soon you'll be all organised.It's been a big project eh? Hello Chris. What a lovely day out you gave your mum - and yes, I agree, £9 sounds a lot - but if it lasts a year - well - you can get to see it in all the seasons A real extra bonus! I see excitement is mounting at the thought of your new room...enjoy it! Have a special Easter celebrating the death and resurrection of Jesus. Ann Hathaway's home is gorgeous and would love to visit it someday. I also love how you used your creative talents to decorate your mums cozy room. Your quilting work is beautiful! Aw, lovely day out in Stratford there! Hasn't the weather been glorious? I've been out diggin my veg beds over too...I've got lots of plants on the greenhouse, but this sunshine has got to break and I don't want to lose the first lot of seedlings to ta frost! What a cozy room you have prepared for your Mom. Thank you for sharing your lovely photos! Beautiful tulips even if they are only yellow and red! :) It is the same with mums here. It seems only the yellow one prevail. Well you have been a busy bee, haven't you? 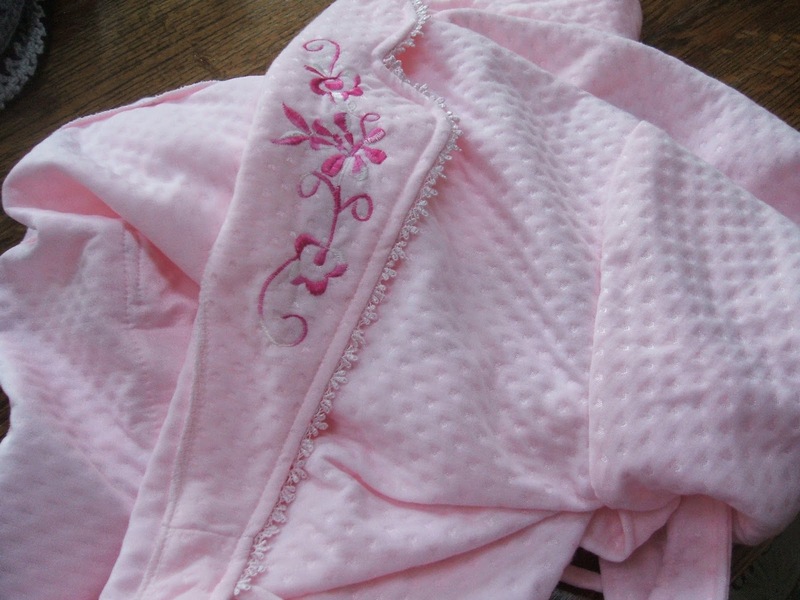 Gorgeous photos and lovely you did some "safety sewing!" 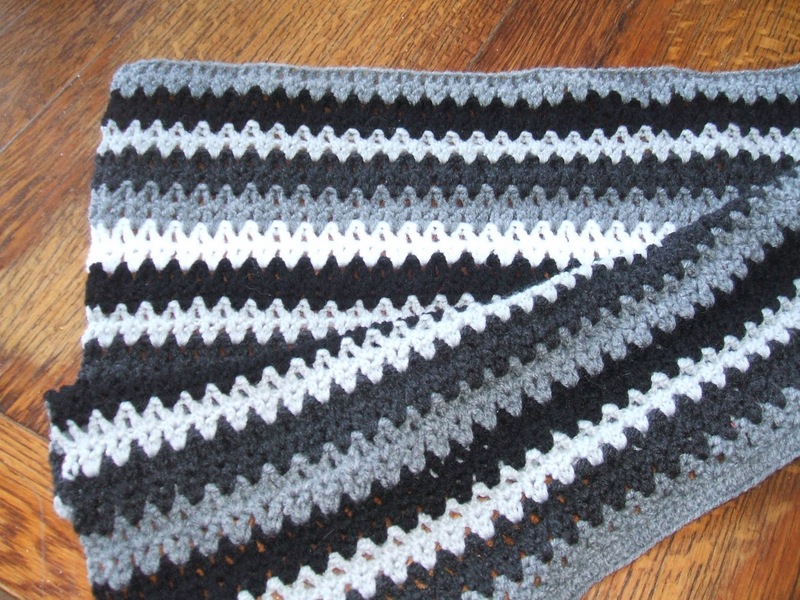 I love the colour of your crochet..sounds like you are like me....I never seem to be able to just follow a pattern, I'm always altering them, by design or by mistake! Thanks for calling by at mine earlier. I'm a little later visiting today cos I've been cleaning, sorting and tidying [again] ready to put our house on with another estate agent....got to get this house sold!! Fab photos. 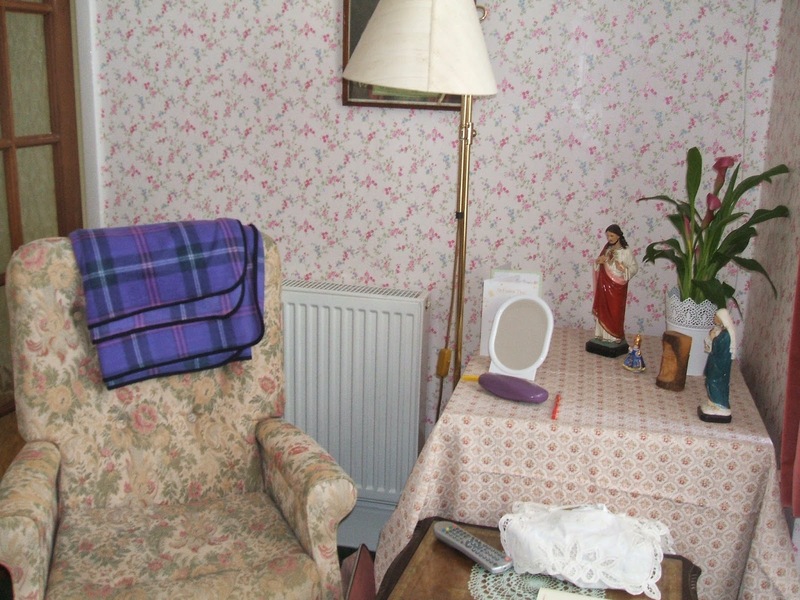 Your Mum's room looks fab....I'm sure she will settle in very happily there. Hi Chris, looks like everything is coming together for you. Your mum looked really happy on her day out. So nice to have your mom with you. I live next door but her health is getting so bad that my brother is coming to help make some major decisions as dad is having difficulty taking care of her. Anyway, thanks for popping by and Happy Easter. Lovely pics. Looks like you had a lovely day. Thanks for visiting. I love how you split the post in 3! Very clever! And what a lovely Mum you have! I'm sure that you all had a wonderful time! Hi Chris, thanks for your visit earlier, You have been busy decorating your Mums room and gardening and finishing that cushion. 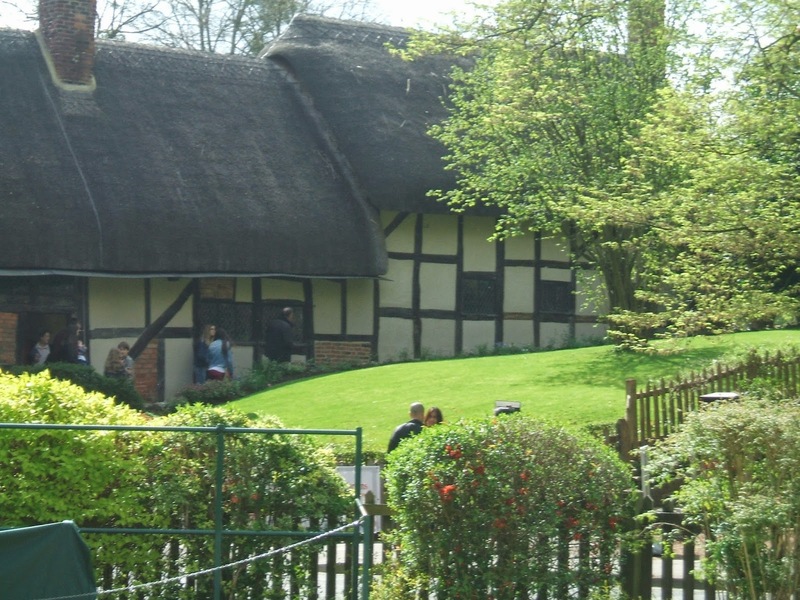 And getting to Ann Hathaway's cottage and taking all those lovley pictures. The sun seems to have encouraged lots of folk to put photos, other than craft, on their pages, both God's glorious creation and man made scenery. Love your past, present and future pictures, Chris! It looks as if your mum had a lovely outing. Mine is now 93 and extremely fit for her age - she does use a stick when out and about these days but it's mostly for balance. She's pretty independent in the annexe but has us just through the door, keeping an eye on her every day. 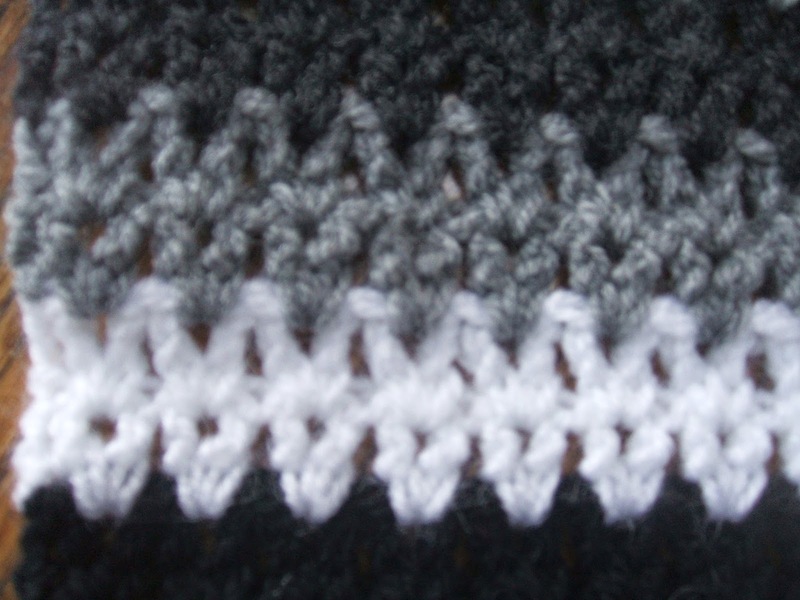 Thanks for your visit and your nice comment - so glad you like my knitting! As for the Big Surprise - it's imminent now! Got some news today. So keep watching my blog!!! Happy belated WOYWW and every blessing as we celebrate the Lord's Resurrection Day. What a lovely family outing! Such a beautiful place! 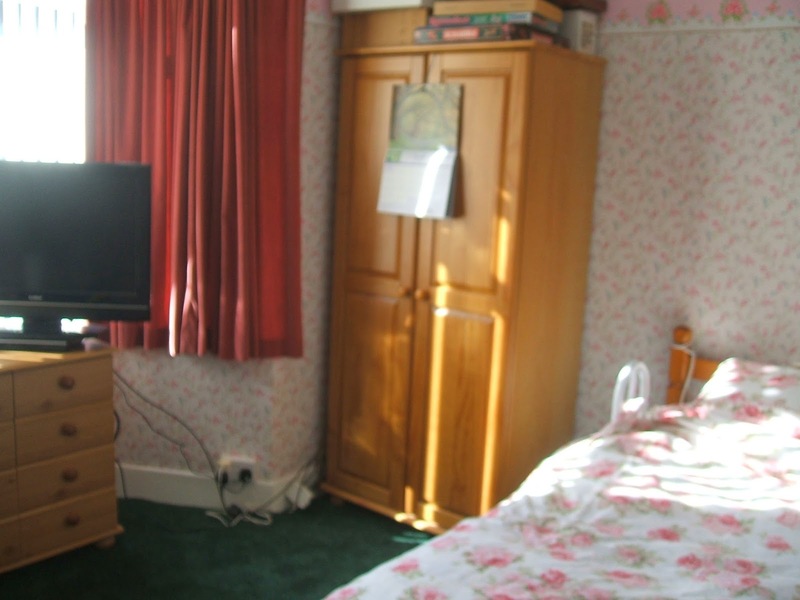 Your mum's room is really nice and cheery! Have a wonderful day and Thanks for the visit! wonderful indeed seeing the cottage again.. saw it years ago now when over there in Summertime .. lovely room for mum too how special! 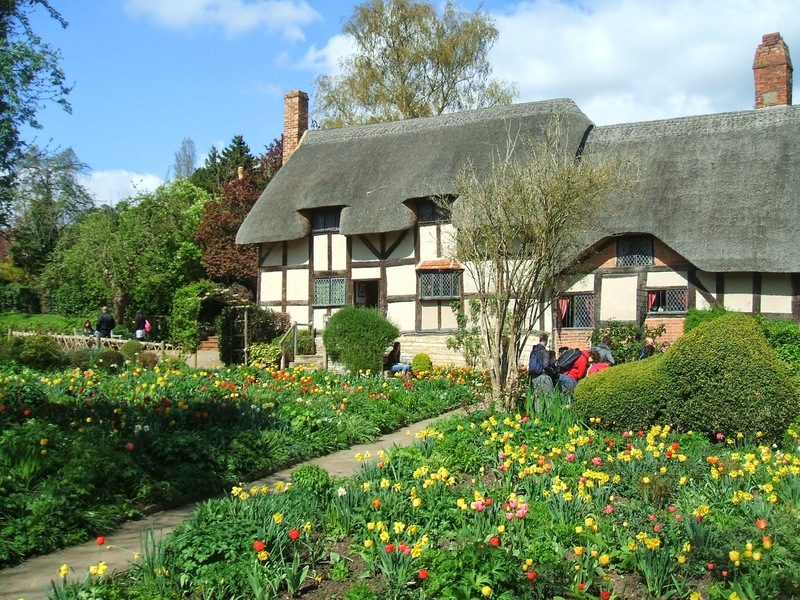 I've been to Stratford several times, but never went round Ann Hathaway's house. Your mum has a lovely bright room. Now they are stunning pics of Stratford and it looks like you all had a lovely time. So nice to have these gorgeous photos with your mum. Well done with the crochet. What a pretty room for Mum. Looking forward to seeing your new craft room! What an adventure you had at Ann Hathaway's home. The garden is so stunning. I wonder if the tulips change color due to the soil? I've read something about hydrangeas and if you want them a certain color then there has to be a certain balance to the soil. I can't wait for your return in June as I love sweet peas and can't wait to see the garden. Is your mother living with you? 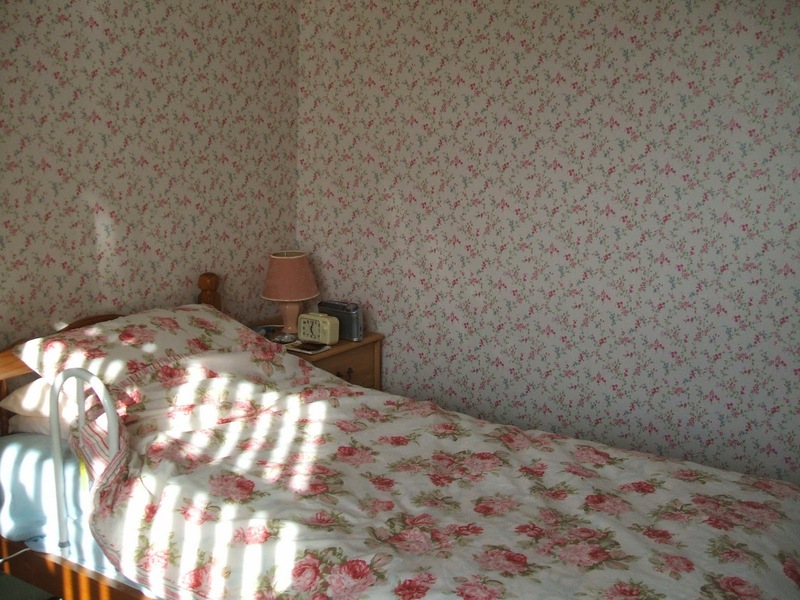 Her room is so sweet - love the wallpaper and the bed spread. A cozy, lovely room for sure. Wow Ann Hathaway's home, what a wonderful structure. The garden is so stunning and thanks for all the lovely pictures.